Preheat oven to 400. Spray or grease an 8x8 baking dish. For the cornbread layer: In a medium bowl, whisk together cornmeal, flour, baking powder, and spices. Beat in the egg, cheese, milk, and oil until well combined. Set aside. In a large skillet, heat a small amount of oil, then saute onion, pepper, garlic, green tomatoes until the onions soften. Add beef and sauté until the beef is cooked through. Stir in sauce and spices. Cook about 5 minutes or until the entire mixture is cooked though and the majority of the liquid has evaporated. Spread evenly into the prepared dish. The mixture should fill the majority of the pan, but don't worry, the batter will fit. Spoon the batter evenly over the chili mixture to cover completely. Smooth with the back of a spoon or spatula. *I bought this at Aldi but I am sure it is the same as what is sold by El Pato in Mexican and large well-stocked grocery stores. If you can't find it, sub in 1 can plain tomato sauce and increase the spices to taste. I almost didn't post this now but it was so good, I had to! A lot of green tomatoes are for springy, summery dishes because green tomatoes are unripe tomatoes and well, that is the start of tomato season. Personally, I would never pick a green tomato because I love red tomatoes so much so I wait until fall to eat green tomatoes unless one falls off the vine. They are much firmer than ripe tomatoes but they cook up well. The most popular green tomato recipe seems to be fried (thanks Fanny Flagg) but I think they are good in other ways too. We haven't had a frost yet and my parents left on a long cruise last week leaving them with tons of green tomatoes on the vine. Rather than have them go to waste, they sent me home with a huge bag for me and a bag for my friend Olga. You can leave them to ripen on their own but you can also use them green of course! Most of them were cherry tomatoes so not the best or easiest choice for frying. I've pickled them before but I thought I'd try something different. Since it is a dreary fall week, I made this easy chili pie for lunch yesterday. It really is simple, I had the idea and it was on the table in under an hour! 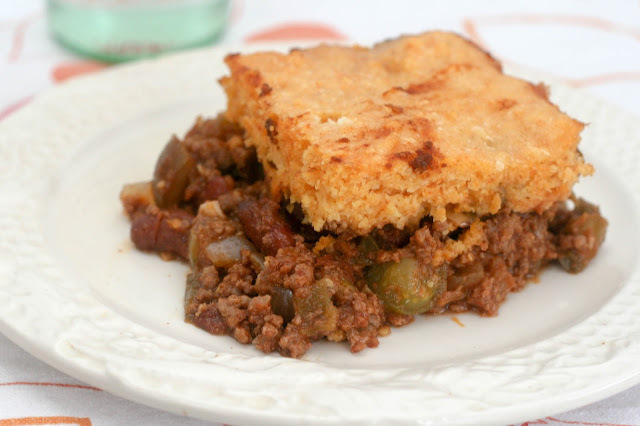 The cornbread layer is nicely spicy and cheesy and balances out the hearty chili below. The tomatoes add a slight tartness to the chili which I find appealing.